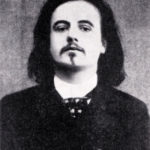 Alfred Jarry was a French symbolist writer who is best known for his play Ubu Roi (1896). He also coined the term and philosophical concept of ‘pata physics. Jarry was born in Laval, Mayenne, France, and his mother was from Brittany. He was associated with the Symbolist movement. His play Ubu Roi (1896) is often cited as a forerunner of Dada, and to the Surrealist and Futurist movements of the 1920’s and 1930. Jarry wrote in a variety of hybrid genres and styles, prefiguring the postmodern. He wrote plays, novels, poetry, essays and speculative journalism. His texts are considered examples of absurdist literature and postmodern philosophy. "It is conventional to call “monster” any blending of dissonant elements. I call “monster” every original inexhaustible beauty." "Blind and unwavering undisciplined at all times constitutes the real strength of all free men."